St Samson was born in Wales about 476, was trained by St Illtud and ordained bishop by St Dyfrig. He set off to spread the Gospel in Brittany. His Life was written a little while after his death and is perhaps the most accurate of the all the early Lives of Saints known to us. Golant is at the southern end of the Saints Way that crosses Cornwall from Padstow to Fowey, following the route taken by monks who travelled from Wales to Brittany. 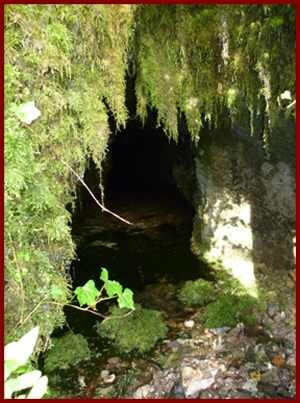 Here St Samson found a cave from which he cast out a serpent and used it as a place of prayer. 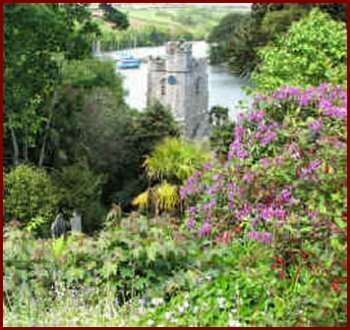 It is partially hidden by the short railway line which once carried iron ore from Lostwithiel to Fowey for shipment. 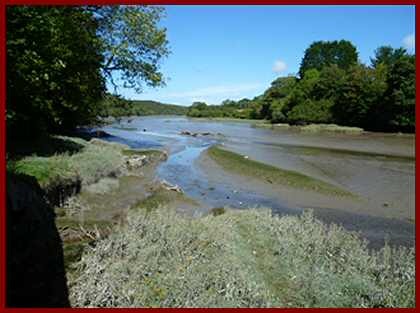 Being right by the river it has splendid views up the two branches of the Fowey rivers that meet here. On a dry and sunny day it must have been a pleasure to prayer there. Being an ascetic though he might have prayed standing in the river in the pouring rain. His holy well is by the side of the church up the hill. 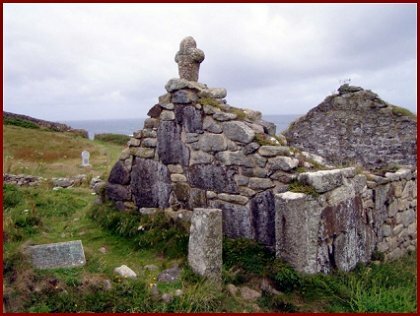 Another hermit’s dwelling can be seen at Roche. 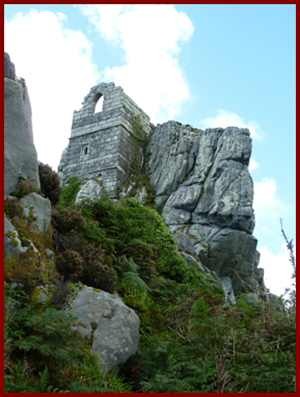 The ‘rock’, is a remarkable granite outcrop, one of the best landmarks in Cornwall. The building now on top is 15C and dedicated to St Michael. An iron ladder now affords access. This rock is immensely ‘iconic’. The local church is dedicated to a St Gundred, which may give us a clue who may have lived there much much earlier. It is likely to have been used from the earliest times. The place has, not surprisingly, attracted much folk-lore. 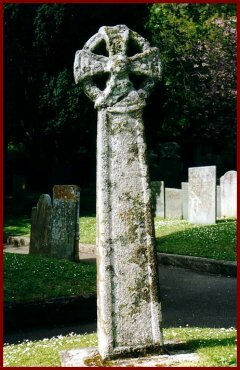 This ancient cross head comes from St Petroc’s monastery. Smashed at the Reformation it is now restored on a new shaft. Up on the north coast, Little Petherick lies in an inlet of the river Camel. St Petroc had a cell and holy well here. He prayed, as was common in ancient times, in water up to the neck and with outstretched hands. It is a lovely spot where all is peace and quiet. These saints, for all their austerities, did have a knack of finding beautiful places. The northern coast in Cornwall is full of stunning sandy bays where saints built their cells. 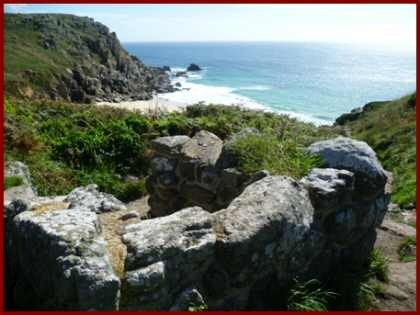 In the sand dunes of St Constantine’s Bay are the remains of a church built over St Constantine’s cell and well. He is said to have been a 6C king who preferred the life of prayer. St Cubert (6C) from Wales (also Dwbert) evangelised the area now called (St) Cubert after him. There was a wallpainting of St Cubert in the church till it was whitewashed at the reformation; the prefix ‘St’ was dropped at the same time. 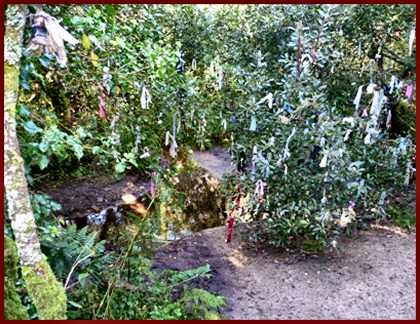 He has a very attractive holy well to the west of the village in the same dunes. There is another well on the seashore famous for its coloured limestone deposits. 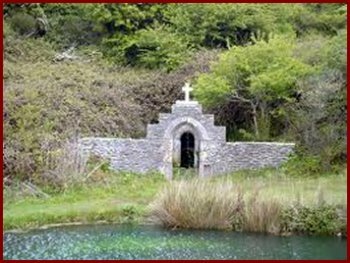 Which of the 2 wells gave its name to ‘Holywell Bay’ is disputed but it is more likely to be the first well. 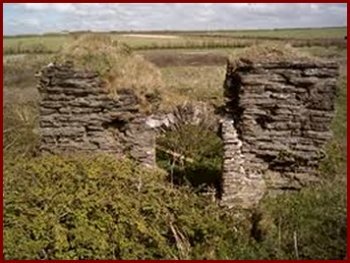 St Carantoc was a companion of St Cubert and he too has left his name to the nearby village of Crantock. The names of St Columb Major and St Columb Minor commemorate another virgin beheaded by her spurned suitor. The well associated with her can be seen at Ruthvoes. It has been restored. 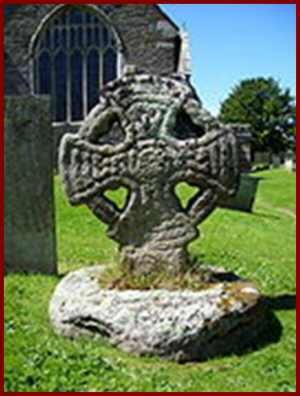 In the churchyard at St Columb Major is a splendid cross head. 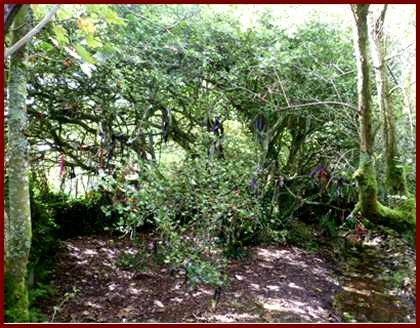 In the churchyard at St Mawgan in Pydar is a holy well, some crosses, and also a living piece of holy thorn from Glastonbury. But this place has better secrets. The ancient manor house of Lanherne next to the church belonged to the local Catholic gentry, the Arundels. After the suppression of monasteries at the Reformation, any English women who wished to become a nun went to the Convent for English Carmelites founded in Antwerp in 1619 under the direction of the Venerable Anne of Jesus, companion of the great St Teresa. With the occurrence of the French Revolution once more they had to flee. But, due to the Toleration Act in 1781 granting freedom of worship to Catholics, they were able to come to Lanherne in 1794 and make their enclosed convent here. The life of prayer continues almost palpably. It is such a lovely quiet place. Further, a beautiful ancient cross has been brought here and placed just outside the convent. 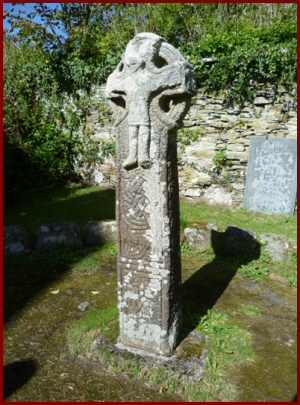 It has a notable ‘Christ in victory’ characteristic of Irish and Eastern crosses. The Living Tradition definitely continues here. the square outline of the oratory can be clearly seen in the middle of the picture. St Piran, like St Petroc, was probably from Ireland. 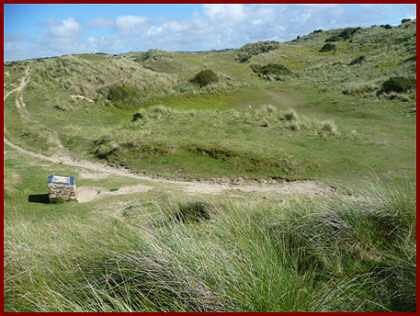 He had a small oratory in the sands at Perranabuloe (‘St Piran in the sand’) When, in the 12C, the sand could not be stopped from covering it, another church was built in the dunes further to the west – which in due time was also buried. The oratory was excavated but had to be re-buried because it could not be preserved. The second church has been dug out and can be seen. There is a fine early cross nearby. St Phillack (Piala) was one of the Irish group associated with St Ia who landed in the Hayle estuary. 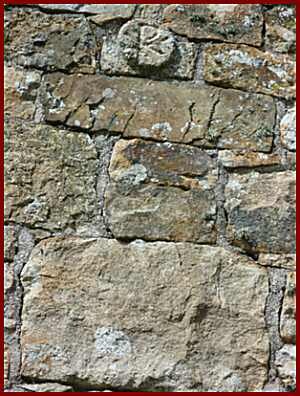 An early Chi-Rho carving has been found and is now set in the church tower at Phillack. Remarkably, this may have come from a Christian settlement from Roman times, or at least earlier than the Irish immigrants. Another splendid early cross with regnant Christ can be seen in the churchyard. In the estuary of the Fal. 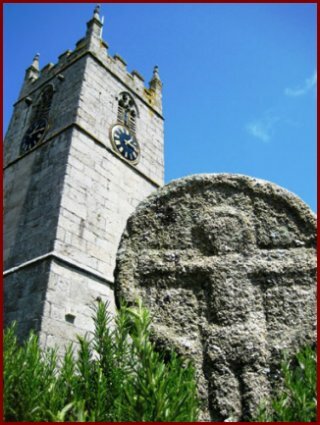 early church foundations were made at St Just, St Mawes and St Mylor. 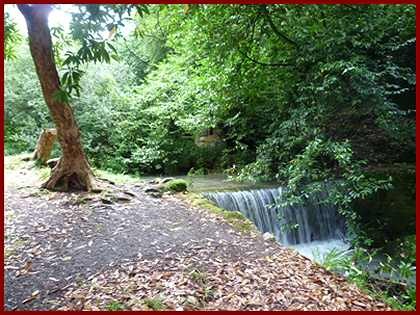 St Just is tucked away up a creek in a little wooded valley with many sub-tropical plants. This has to be one of the most beautiful places in Cornwall. A trip on the nearby King Hal ferry is worthwhile if only to see the deep green waters and the densely wooded sides – sights which must have brought awe to the early monks. 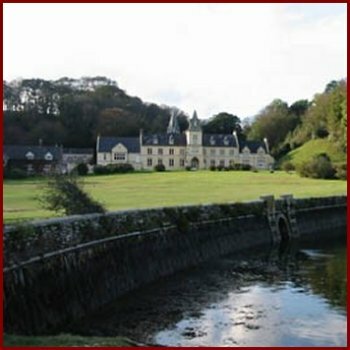 I cannot leave the Fal without a mention of St Anthony’s in Roseland. Perhaps in the lives of all of us we find a corner of the world which seems to hold us spellbound. I found St Anthony’s years ago. Somehow its peace and quiet, its lovely creek, the trees, the headland close by, the flowers, and the birds, exercised an enchantment I have never been able to forget. It is one of the legendary possible places for the landing of Jesus and Joseph of Arimathea and, given the peace of the place one can see why. It was, I have read somewhere, the place of an early monastic cell of prayer until such time as, in the 12C, the Augustinian Canons of Plympton in Devon built the church and priory. The former survives but not the priory as such, which became the house in front of it.. 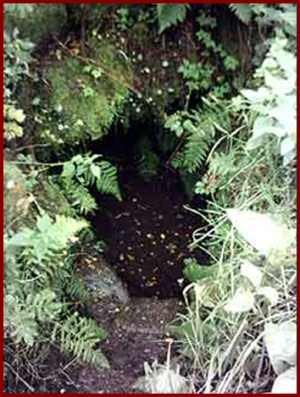 The ancient holy well can still be found by the church. All in all a place of peace and mystery which leaves an abiding impression. 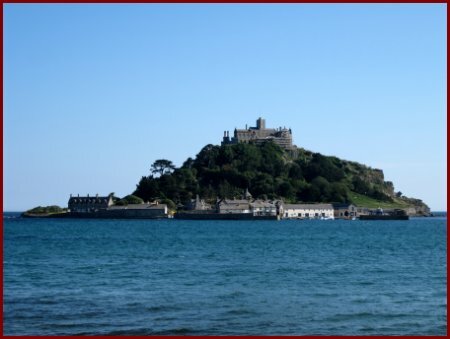 St Michael appeared to fishermen at St Michael’s Mount in 495. There would seem to have been monks here since the 8C. St Michael’s Mount in Normandy was built around the same time. Skellig Michael off the coast of Ireland was founded earlier, in the 7C. Beyond Penzance is Madron. 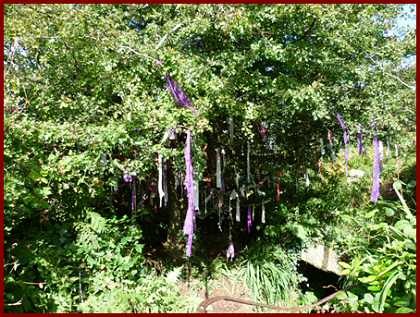 Here is an ancient and very famous holy well and rag tree. - it could even date to the 6C. It is quite astonishing. The sunlight danced like fire upon its walls. Here we are at the heart of the ancient church of this land. 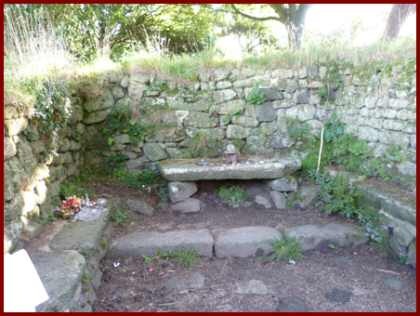 Inside it is the altar and the ‘bed’ (grave) of St Madern. One laid on it in order to be healed. At Sancreed not far away is another chapel, holy well and holy tree. St Credan is said be the founder, It was re-discovered in the late 19C. The baptistery has a deep well which makes full immersion easy. The ruins of another early small chapel are evident. The cloutie (rag) tree was full of rags. Two holy wells and two holy trees can be seen not far away at Chapel Euny. St Euny came from Ireland with St Ia and the group who landed at Hayle. There was an Iron Age fort here on Carn Euny, the high point of the moors of West Penwith. A complex of stone buildings evolved Romano-British times, which seem part Iron Age round house and part Roman villa lasting till 5C. They were served by these wells. Here we are at the closest possible interface between the pre-Christian and Christian eras. St Buryan is almost the last village on Land’s End. St Buryan, a female saint, possibly from Ireland, may be the founder. The church has a fine round tower which dominates the entire landscape for miles around. At the end of the road is the fine church of St Levan’s. There was a very early church here, with an ancient holy stone and several crosses. 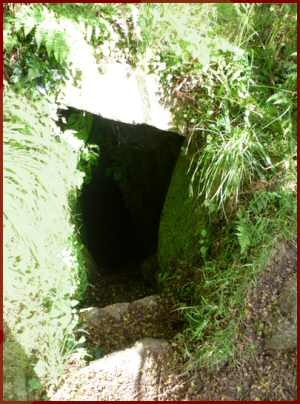 The baptistery and well of St Levan lies on the path down to the sea above a cleft in the cliffs. 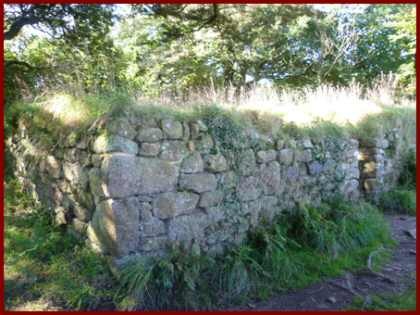 This chapel, like those at Madron and Sancreed, could go back to very early times. St Helen may have been one of those who came from Wales to evangelise. This oratory at least in part may go back to the 5C. A Romano-British Chi-Rho was found here but has since been lost, thrown down a well in St Just by one of the local clergy! It is a strange feeling making one’s way through these ancient towns towards ’Land’s End’. It is like going to the ‘end of Britain’ not only in space but also in time’. The Britons achieved more than is usually recognised. 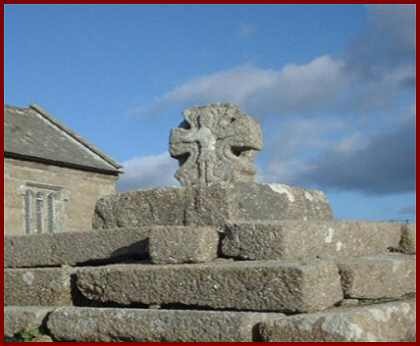 600 crosses (though not all ancient) and 200 holy wells can be found in Cornwall. 600 tiny Christian communities shaped this land. It was a huge achievement.